The next question was about something pretty much all of us online geeks have already noticed about the movie. It’s the absence in the release version of “Iron Man 2” of a brief moment in the trailer involving Pepper Potts/Gwyneth Paltrow assisting Iron Man/Tony Stark (Downey) as he gets ready to fly down into an adoring stadium crowd as part of the massively glitzy intro for his Stark Expo. “Gwen is just finding out this scene was cut, Jon. You might be a little more tactful,” interrupted Downey, generating a laugh. Speaking of Gwyneth Paltrow, the next question was for the two women on the panel, Paltrow and Scarlett Johansson. How would the movie’s two decidedly powerful women handle having to “save the world” in contrast to the male characters? Who would be better at it? Then a journo dared to go a bit off-topic and asked Downey about whether he would be taking a rumored gig as the title role in the long, long delayed film of Anne Rice’s The Vampire Lestat. “Yeah. In anything that’s going on, just imagine it’s been offered to me,” said Downey. “Precious 2,” offered Don Cheadle, the new James “Rhodey” Rhodes and eventual War Machine of this sequel. Another writer asked Mickey Rourke how much fun he had in his “electrifying performance” as the vengeance driven, Russian-accented super-villain, Whiplash, aka Ivan Vanko. Then a reporter asked Downey if, growing up, he ever dressed up as a superhero for Halloween. Then there was a question asking if the rather large amount of improvisation employed on the original “Iron Man” continued on “Iron Man 2.” How much of what was seen in the film was part of the original screenplay? The next question that came up was for Don Cheadle, who is stepping in for Terrence Howard as James “Rhodey” Rhodes, who becomes War Machine, a sort of co-Iron Man. What was it like replacing the respected actor, who left the franchise for reasons that remain vague and somewhat contentious. What was it like wearing the suit? “Terrence is a friend; I’ve known him for a long time,” Cheadle continued, referring to their work together in the Oscar-winning “Crash,” which Cheadle produced. “It was good to also kind of see him and put anything to bed that people might think there was a problem. There wasn’t. We’re cool,” he said, moving on to mention the childlike fun of playing with “the best toys” and pretending to be a superhero. Another question about how Downey felt working with new cast members segued into a discussion of writer Justin Thoreaux’s contribution and how he worked through a “horrible” neck problem. “These guys had a really good rapport from ‘Tropic Thunder’ and he understood his voice and how to weave in and out of Robert’s creative process very effectively. And to jump on board a franchise, it was probably the sharpest learning curve for Justin than all of us and he really did a fantastic job,” said Jon Favreau. That segued into praise for Sam Rockwell, who steals several scenes as Tony Stark’s unctuous business adversary, Justin Hammer, and a discussion about the parrots used in the film as pets for Mickey Rourke’s character. A suggestion made by Rourke to help humanize his bad-guy to some degree. One of the birds apparently belongs to the pet-loving actor. “Marvel likes to cut costs,” Favreau said. “You guys cut costs so much, you guys ate the second bird,” added Don Cheadle. After some frivolity involving Gwyneth Paltrow’s definition of heroism somehow being related to the Goop newsletter, the conversation turned to the “Moonlighting”-esque romance between Tony Stark and Pepper Potts and the “highly anticipated” kiss that finally occurs between Downey and Paltrow’s character in the new film. How did the actors feel about it? “I couldn’t get her off me. It was embarrassing,” Downey offered. “It was great because both my husband and his wife were right there,” Paltrow offered, more believably. The next writer lucky enough to be acknowleded got two questions off. He asked Downey about working with his wife, Susan Downey, as one of the films executive producers. 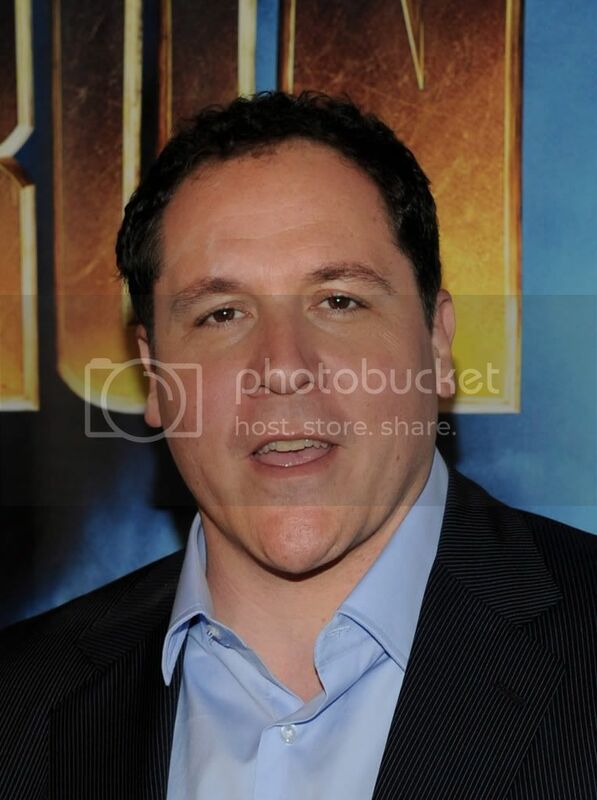 Jon Favreau was, in turn, asked about the fact that his portrayal of Happy Hogan was far more prominent in the sequel and even involved some rather humorous and deftly handled action moments. Downey, apparently afraid of too much tidiness, suggested he and Favreau swap questions. “Can I have my question back?” asked Favreau. Favreau responded predictably that, in fact, there had not been a falling out and Rockwell was busy on the opposite coast doing a play. He further praised his acting and called Rockwell, a “fun, funny guy” and “inspiring and inspired.” He particularly cited Rockwell’s work as a “gender unspecific concierge” in Favreau’s 2001 feature directing debut, “Made.” Prompted by the passive-aggressive questioner, he also admitted that Rockwell had actually been considered for the role of Tony Stark, even before Downey. “That’s enough. You’re embarrassing yourself,” Downey said, presumably joking with Favreau. The would be Helen Thomas of entertainment journalism tried for one last, more positive, scoop. He commented that Scarlet Johansson was “fantastic” as the Black Widow. Was there likely to be a Black Widow spin-off movie? Again, what was Favreau supposed to say? “I would love to see that. Hell, yes,” said Favreau. When prompted by Scarlett Johansson, who obviously has an interest in the matter, producer Kevin Feige said, “Definitely possible.” At last, the movie scoop of the century. That was followed by a much less aggressive question about DVD extras. The short version is that there’ll be many and they’ll be largely for the very geeky. “We did overkill on this one,” Favreau admitted. Then came a relatively serious question about the physical and mental challenges of the role for Downey and Paltrow. After both of them briefly hesitated about who would answer first, Downey stepped in after Paltrow said he should go first. “Yeah, they probably want to hear me first,” he agreed. “He made them do it all in CGI, like, ‘Get it in CGI. I’m walking off,'” said Paltrow. That was followed by a rather serious discussion from Downey in which he contemplated the emotional journey of Tony Stark’s character vis-à-vis Whiplash, Rhodey/War Machine, Natasha Romanoff/Black Widow, and Pepper. Just as he reached a sort of intellectual crescendo, the giant poster for “Iron Man 2” behind him fell down, leaving an empty frame behind the speakers’ table. “Ladies and gentlemen, Sam Rockwell!” said Downey, leaving his chair for a vain attempt to rehang the poster. After that, things just got kind of silly. In regards to the timeline question (and this is a MAJOR SPOILER, so I suggest anyone who hasn’t seen the film not read any further), it’s obvious that “Iron Man 2” takes place before “The Incredible Hulk” because Stark is working with S.H.I.E.L.D. in the latter’s post-credit sequence, while that doesn’t happen in “IM2” until the very end. There’s another another way to tell in “IM2,” too. Toward the end of the film, keep your eyes on any televisions that may be playing in the background and you’ll spy something on the news which clarifies the timeline.